Le 25 mars 1998, le président Bill Clinton se rendait à l’aéroport de Kigali et, sans en sortir, présentait ses excuses pour l’inaction des États-Unis au cours du génocide. Deux années plus tard, le Premier ministre Guy Verhofstadt présentait à son tour les excuses officielles de la Belgique lors de la commémoration officielle du génocide au site de Gisozi. Il réitérait ses propos en 2004 à l’occasion de la dixième #commémoration du #génocide au stade Amahoro. D’autres pays, en premier lieu la France, ont toujours refusé de participer à cette « diplomatie des #excuses 1 » (à ce sujet, voir Rosoux ; Gibney & Howard-Hassmann). Depuis 1994, des associations de rescapés ainsi que les autorités rwandaises réclamaient des excuses officielles de l’#Église_catholique rwandaise et du #Vatican pour leurs rôles dans le #génocide des #Tutsi. 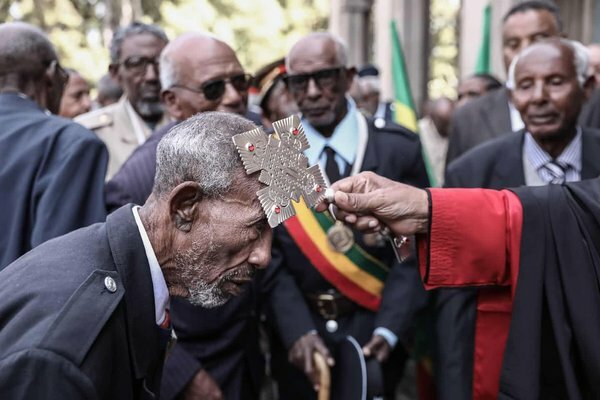 Vingt-trois années après ces premières demandes, et après bien des controverses, le pape François a officiellement imploré en mars 2017 « le pardon de Dieu » pour les échecs de l’Église au Rwanda. Afin de comprendre ce geste politique, il est nécessaire de revenir sur les débats relatifs à la responsabilité de l’Église catholique au Rwanda avant et pendant le génocide ainsi que sur les étapes ayant conduit aux excuses officielles. En 1989, les marolliens, de la rue de la #samaritaine, firent #grève. La grève des #matelas. Parce que les pompiers avaient décidé que leur logement était insalubre, dangereux, parce que la commune de Bruxelles avait envoyé sa police afin de distribuer les avis d’expulsion à qui de droit, parce qu’aucune alternative de relogement ne leur était proposée, pour ces raisons, les personnes concernées, et des sympathisants, manifestèrent en dormant sur desq matelas dans la rue. Lieu où les entités communales, fédérales, les envoyaient vivre, n’ayant plus de logement. De cette manifestation naquit un mouvement pour le droit à un logement digne pour tout citoyen. Malheureusement, ce combat est toujours d’actualité. In 1918, a state-sanctioned vigilante force killed 15 unarmed Mexicans in #Porvenir. When their descendants applied for a historical marker a century later, they learned that not everyone wants to remember one of Texas’ darkest days. How did a last-gasp effort, characterized by factual errors and inflammatory language, manage to convince the state agency for historic preservation to reverse course on a marker three years in the making and sponsored by a young Latina historian with an Ivy League pedigree and Texas-Mexico border roots? An Observer investigation, involving dozens of interviews and hundreds of emails obtained through an open records request, reveals a county still struggling to move on from a racist and violent past, far-right amateur historians sowing disinformation and a state agency that acted against its own best judgment. 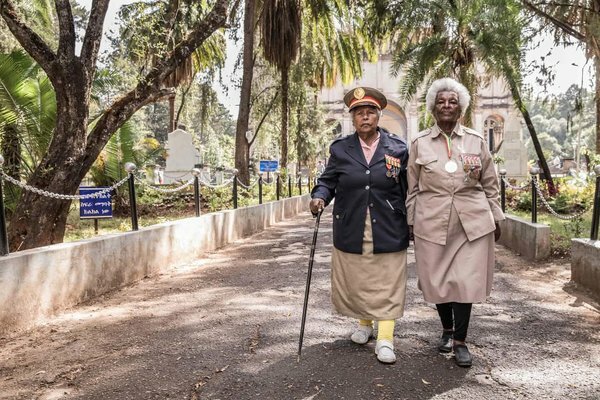 In 1998, Benita and her husband, Buddy, began tracing their family trees. Benita was perplexed that she couldn’t find any documentation about her grandfather, Longino Flores. Then she came across the archival papers of Harry Warren, a schoolteacher, lawyer and son-in-law of Tiburcio Jáquez, one of the men who was murdered. Warren had made a list of the victims, and Longino’s name was among them. Warren also described how one of his students from Porvenir had come to his house the next morning to tell him what happened, and then traveled with him to the massacre site to identify the bodies, many of which were so mutilated as to be virtually unrecognizable. Benita immediately saw the possible connection. Her father, 12 at the time, matched Warren’s description of the student. Benita and Buddy drove from Uvalde to Odessa, where her father lived, with her photocopied papers. “Is that you?” she asked. He said yes. Then, for the first time in 80 years, he began to tell the story of how he was kidnapped with the men, but then sent home because of his age; he was told that the others were only going to be questioned. 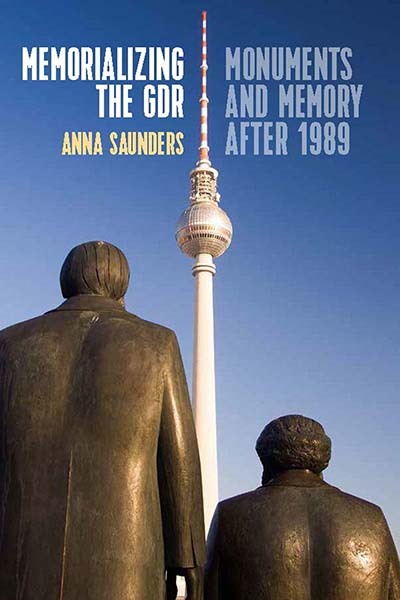 To Benita and Buddy’s amazement, he remembered the names of 12 of the men who had been murdered. They were the same as those in Harry Warren’s papers. He also remembered the names of the ranchers who had shown up at his door. Some of those, including the ancestors of prominent families still in Presidio County, had never been found in any document. Talking about the massacre proved healing for Flores. His nightmares stopped. 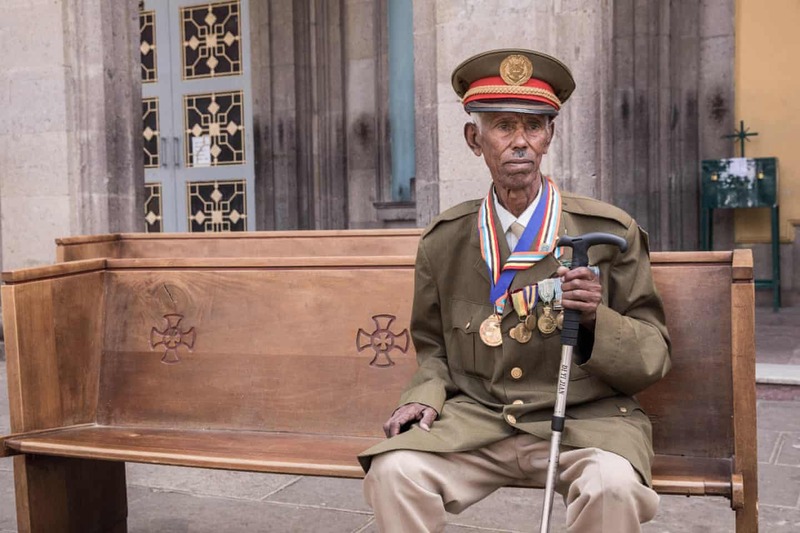 In 2000, at age 96, he decided that he wanted to return to Porvenir. Buddy drove them down an old mine road in a four-wheel-drive truck. Flores pointed out where his old neighbors used to live, even though the buildings were gone. He guided Buddy to the bluff where the men were killed — a different location than the one commonly believed by local ranchers to be the massacre site. His memory proved to be uncanny: At the bluff, the family discovered a pre-1918 military bullet casing, still lying on the Chihuahuan desert ground. Benita and Buddy began advocating for a historical marker in 2000, soon after their trip to Porvenir. “A lot of people say that this was a lie,” Buddy told me. “But if you’ve got a historical marker, the state has to acknowledge what happened.” Their efforts were met by resistance from powerful ranching families, who held sway over the local historical commission. The Albarados had already given up when they met Monica Muñoz Martinez, a Yale graduate student from Uvalde, who interviewed them for her dissertation. In 2013, Martinez, by then an assistant professor at Brown University, co-founded Refusing to Forget, a group of historians aiming to create broader public awareness of border violence, including Porvenir and other extrajudicial killings of Mexicans by Texas Rangers during the same period. The most horrific of these was La Matanza, in which dozens of Mexicans and Mexican Americans were murdered in the Rio Grande Valley in 1915. In 2006, the THC created the Undertold Markers program, which seemed tailor-made for Porvenir. According to its website, the program is designed to “address historical gaps, promote diversity of topics, and proactively document significant underrepresented subjects or untold stories.” Unlike the agency’s other marker programs, anyone can apply for an undertold marker, not just county historical commissions. Martinez’s application for a Porvenir massacre marker was accepted in 2015. Though the approval process for the Porvenir marker took longer than usual, by the summer of 2018 everything appeared to be falling into place. On June 1, Presidio County Historical Commission chair Garcia approved the final text. (Garcia told me that she thought she was approving a different text. Her confusion is difficult to understand, since the text was attached to the digital form she submitted approving it.) Martinez began coordinating with the THC and Arlinda Valencia, a descendant of one of the victims, to organize a dedication ceremony in El Paso. In mid-June, Valencia invited other descendants to the event and posted it on Facebook. She began planning a program to include a priest’s benediction, a mariachi performance and brief remarks by Martinez, Senator Rodríguez and a representative from the THC. The event’s climax would be the unveiling of the plaque with the names of the 15 victims. For generations, ranching families like the Brites have dominated the social, economic and political life of Presidio County. In a visit to the Marfa & Presidio County Museum, I was told that there were almost no Hispanic surnames in any of the exhibits, though 84 percent of the county is Hispanic. The Brite family name, however, was everywhere. White and others in Presidio County subscribe to an alternative history of the Porvenir massacre, centering on the notion that the Porvenir residents were involved in the bloody Christmas Day raid. “They weren’t just simple farmers,” White told me, referring to the victims. “I seriously doubt that they were just killed for no reason.” Once he’d heard about the historical marker, he said, he’d talked to everyone he knew about it, including former Texas Land Commissioner Jerry Patterson and Mona Blocker Garcia. I visited Garcia at her Marfa home, an 1886 adobe that’s the same age as the venerable Marfa County Courthouse down the street. Garcia, 82, is Anglo, and married to a former oil executive whose ancestry, she explained, is Spanish and French Basque. A Houston native, she retired in the 1990s to Marfa, where she befriended the Brite family and became involved in local history. She told me that she had shared a draft text of the marker with the Brites, and they had agreed that it was factually inaccurate. The actual history is quite clear. In the days after the massacre, the Texas Rangers commander, Captain J.M. Fox, initially reported that Porvenir residents had fired on the Rangers. Later, he claimed that residents had participated in the Christmas Day raid. Subsequent investigations by the Mexican consulate, the U.S. Army and state Representative J.T. Canales concluded that the murdered men were unarmed and innocent, targeted solely because of their ethnicity by a vigilante force organized at the Brite Ranch. As a result, in June 1918, five Rangers were dismissed, Fox was forced to resign and Company B of the Texas Rangers was disbanded. But justice remained elusive. In the coming years, Fox re-enlisted as captain of Company A, while three of the dismissed lawmen found new employment. One re-enlisted as a Ranger, a second became a U.S. customs inspector and the third was hired by the Brite Ranch. No one was ever prosecuted. As time passed, the historical records of the massacre, including Harry Warren’s papers, affidavits from widows and other relatives and witness testimony from the various investigations, were largely forgotten. 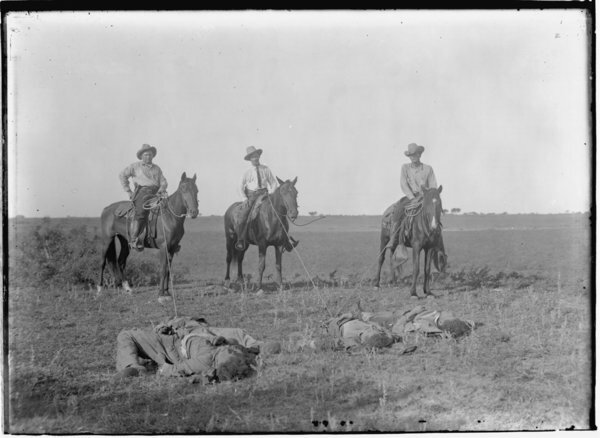 In their place came texts like Walter Prescott Webb’s The Texas Rangers: A Century of Frontier Defense, which played an outsize role in the creation of the heroic myth of the Texas Rangers. Relying entirely on interviews with the murderers themselves, Webb accepted at face value Fox’s discredited version of events. For more than 50 years, Webb’s account was considered the definitive one of the massacre — though, unsurprisingly, he didn’t use that word. 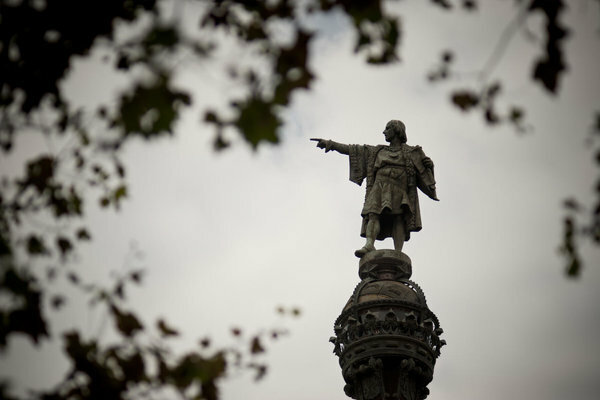 An Observer review of hundreds of emails shows that the state commission was aware of potential controversy over the marker from the very beginning. In an email from 2015, Executive Director Mark Wolfe gave John Nau, the chair of the THC’s executive committee, a heads-up that while the marker was supported by historical scholarship, “the [Presidio County Historical Commission] opposes the marker.” The emails also demonstrate that the agency viewed the claims of historical inaccuracies in the marker text made by Mona Blocker Garcia and the county commission as minor issues of wording. What were the politics that the commission was worried about, and where were these concerns coming from? Garcia’s last-minute letter may have been a factor, but it wasn’t the only one. For the entire summer, Glenn Justice, a right-wing amateur historian who lives in a rural gated community an hour outside San Angelo, had been the driving force behind a whisper campaign to discredit Martinez and scuttle the dedication ceremony. “There are radicals in the ‘brown power’ movement that only want the story told of Rangers and [the] Army and gringos killing innocent Mexicans,” Justice told me when we met in his garage, which doubles as the office for Rimrock Press, a publishing company whose catalog consists entirely of Justice’s own work. He was referring to Refusing to Forget and in particular Martinez, the marker’s sponsor. Justice has been researching the Porvenir massacre for more than 30 years, starting when he first visited the Big Bend as a graduate student. He claims to be, and probably is, the first person since schoolteacher Harry Warren to call Porvenir a “massacre” in print, in a master’s thesis published by the University of Texas at El Paso in 1991. Unlike White and Garcia, Justice doesn’t question the innocence of the Porvenir victims. But he believes that additional “context” is necessary to understand the reasons for the massacre, which he views as an aberration, rather than a representatively violent part of a long history of racism. “There have never been any problems between the races to speak of [in Presidio County],” he told me. In 2015, Justice teamed up with former Land Commissioner Jerry Patterson and Sul Ross State University archaeologist David Keller on a privately funded excavation at the massacre site. He is working on a new book about the bullets and bullet casings they found — which he believes implicate the U.S. Army cavalry in the shooting — and also partnered with Patterson to produce a documentary. But they’d run out of money, and the film was taken over by noted Austin filmmaker Andrew Shapter, who pitched the project to PBS and Netflix. In the transition, Justice was demoted to the role of one of 12 consulting historians. Meanwhile, Martinez was given a prominent role on camera. Justice was disgruntled when he learned that the dedication ceremony would take place in El Paso. He complained to organizer Arlinda Valencia and local historical commission members before contacting Ponton, the county attorney, and Amanda Shields, a descendant of massacre victim Manuel Moralez. “I didn’t want to take my father to a mob scene,” Shields told me over the phone, by way of explaining her opposition to the dedication ceremony. She believed the rumor that O’Rourke and Gutiérrez would be involved. In August, Shields called Valencia to demand details about the program for the ceremony. At the time, she expressed particular concern about a potential Q&A event with Martinez that would focus on parallels between border politics and violence in 1918 and today. “This is not a political issue,” Shields told me. “It’s a historical issue. With everything that was going on, we didn’t want the ugliness of politics involved in it.” By “everything,” she explained, she was referring primarily to the issue of family separation. Benita and Buddy Albarado told me that Shields’ views represent a small minority of descendants. At a meeting of the Presidio County Historical Commission on August 17, Peterson suggested that the executive board played a major role in the decision to pause production of the marker. “I stopped the marker after talking to Rod [Ponton],” Peterson said. “I’ve spent quite a bit of time talking with the chairman and vice-chairman [of the THC]. What we have said, fairly emphatically, is that there will not be a dedication in El Paso.” Through a spokesperson, Wolfe said that the executive committee is routinely consulted and the decision was ultimately his. Garcia confirmed that she had been approached by THC staff. She added that the THC had suggested two specific topics: the Christmas Day raid and a subsequent raid at the Neville Ranch. The idea of additional plaques to provide so-called context that could be interpreted as justifying the massacre — or at the very least setting up a false moral equivalence — appears to have mollified critics like White, Garcia and Justice. The work on a revised Porvenir massacre text proceeded quickly, with few points of contention, once it began in mid-September. The marker was sent to the foundry on September 18. In early November, the THC unexpectedly announced a dedication ceremony for Friday, November 30. The date was one of just a few on which Martinez, who was still planning on organizing several public history events in conjunction with the unveiling, had told the agency months prior that she had a schedule conflict. In an email to Martinez, Sadnick said that it was the only date Nau could attend this year, and that it was impossible for agency officials to make “secure travel plans” once the legislative session began in January. 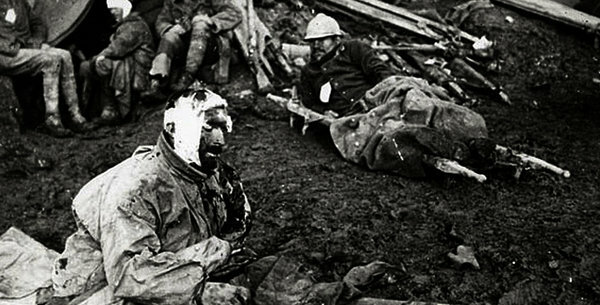 On peut comprendre que des esprits patriotes se sentent aujourd’hui blessés par la décision prise par un certain président français de ne pas offusquer l’Allemagne lors des célébrations du 11 novembre. On comprend aisément que cette décision soit une preuve de plus de la soumission des élites françaises aux élites allemandes. Mais, il me semble que cantonner le problème à ce niveau n’a pas se sens et ne rend pas compte de ce que fut la « Grande Guerre ». Car, indépendamment des marques de soumission de l’élite française et de ses commis-voyageurs politiques aujourd’hui, la victoire française de 1918 n’a jamais été une victoire du peuple français mais sa défaite. Les dynasties bourgeoises qui en 1914 avaient le pouvoir notamment via leur laquais Poincaré ont voulu la guerre et tout fait pour l’obtenir. Cette guerre n’a été que le conflit entre deux bourgeoisies industrielles impérialistes se combattant pour le partage du monde. Le patriotisme n’a rien eu à voir là-dedans. Il n’a été, comme souvent dans la bouche des politiciens de droite que le prétexte à faire passer un bain de sang pour un acte de justice. 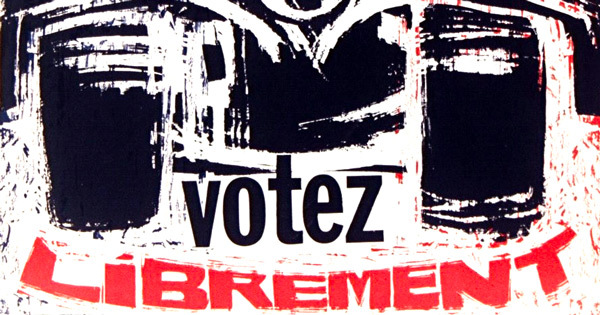 Et on les a vus, les profiteurs de guerre soutenus par l’État, devenir les profiteurs de paix en se faisant attribuer à bas prix les biens allemands mis sous séquestre en Alsace et en Lorraine. On les a vus refuser de payer l’impôt (comme toujours) obligeant l’État a exiger d’improbables réparations jamais acceptées outre Rhin ni outre Atlantique compte tenu des investissement US en Allemagne qui ne devaient pas rapporter à la France. Non, décidément, que la France ait choisi, aujourd’hui comme en 40 (et même avant), de se soumettre à l’Allemagne ne fait pas de doute, mais les trémolos droitistes et militaristes ne prennent pas et ne servent pas la vérité. La « Grande Guerre » ne fut « grande » que par l’injuste et trop grand sacrifice de millions d’innocents tournés « en saucisson de bataille » par des profiteurs qui n’ont pas hésité à leur voler la paix après leur avoir volé la peau et les os. « Nous avons donné tout sans exiger de reçu » a écrit Georges Bernanos dans Les enfants humiliés. Il est grand temps de relire toute la série des Écrits de combats de ce grand mystique attelé comme une bourrique fiévreuse et têtue au lourd chariot de la Vérité. On comprend aisément que cette décision soit une preuve de plus de la soumission des élites françaises aux élites allemandes. Et surtout, on comprend que cette opération « mémorielle » est une opération électorale pour faire croire que l’Union Européenne, c’est « la paix ». Que faisant le gouvernement en mai 68 ? Il excusait les violeurs et agresseurs sexuels. Comment le gouvernement commémore mai 68 en 2018 ? Il ordonne à ses flics accompagnés de fascistes volontaires (dont AF) de tabasser les etudiant.es. Il invite les intégristes cathos au comité de bioéthique pour interdire la PMA. Il organise la pénurie de centre IVG, planning familliale et coupe les vivres aux organisations féministes qui luttent contre les violences sexuelles au travail. Il s’organiser aussi l’appauvrissement des femmes et fait obstacle a l’accès aux aides sociales dont les femmes sont les principales bénéficiaires. Il prépare aussi leur mise à la rue, via la vente des HLM. Il prépare une atténuation des peines et poursuites pour viol et violences sexuelles via une correctionnalisation automatique des viols. La France est un pays paralysé, les banques ne fonctionnent plus, les pompes à essence sont vides. Qu’était #Mai_68 ? Une révolte étudiante contre les hiérarchies, une libération festive des mœurs, certes. 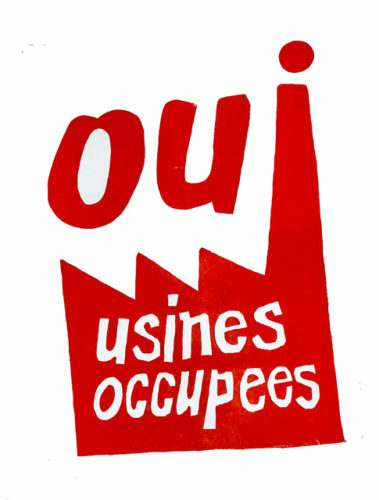 Mais aussi et d’abord la plus grande grève d’ouvriers et d’employés de l’histoire de France, en écho aux grands mouvements de solidarité avec les peuples du tiers-monde, et avant tout avec le peuple vietnamien. À l’occasion du quarantième anniversaire du mouvement, Laurent Bonelli remarquait que « contrairement aux commémorations de 1988 et 1998, encore dominées par la célébration de leaders étudiants, celle de 2008 laisse une place bien plus importante aux masses d’anonymes qui ont inscrit l’événement dans l’histoire et aux raisons pour lesquelles elles l’ont fait. » Ainsi « la mémoire des millions de grévistes qui paralysèrent le pays retrouve enfin une place dans le débat. » Que reste-t-il à dire, écrire ou montrer aujourd’hui ? Pour le cinquantenaire, hors de toute frénésie éditoriale, Le Monde diplomatique invite à une plongée dans ses archives. Cet article propose une réflexion sur les termes de place et d’emplacement en géographie. Il s’agit de montrer comment les discours produits sur les placements permettent à ceux qui les énoncent de se positionner dans le monde dans lequel ils évoluent. Ce questionnement est traité plus particulièrement à partir des discours énoncés par différents acteurs sur les emplacements qu’occupent les morts dans le cimetière laïque du Biollay à Chamonix (Haute-Savoie, France). L’analyse de ces discours permet d’une part, de mettre en évidence le rôle de l’espace et des jeux de placements dans la définition de l’identité et d’autre part, de souligner à quel point l’espace des morts peut être l’objet d’enjeux identitaires structurant aussi le monde des vivants. 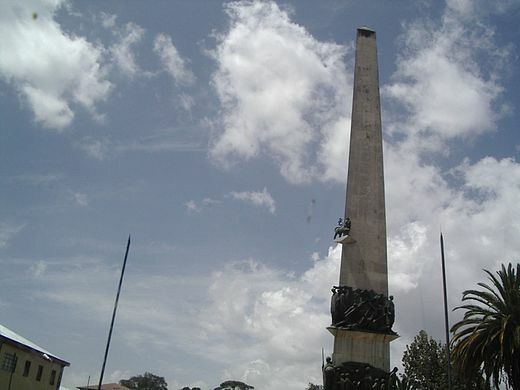 Yekatit 12 (amharique : የካቲት ፲፪) ou monument du 12 Yekatit est un obélisque dressé au centre de la place du 12 Yekatit, dans la ville d’#Addis-Abeba, en Éthiopie. 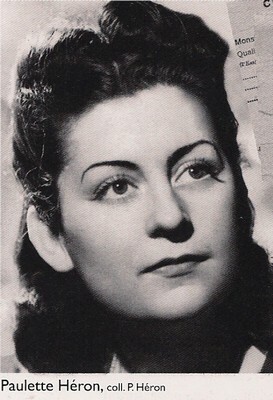 Asmahan (أسمهان), de son vrai nom Amal El Atrach (1918-1944) est une #chanteuse,#cantatrice et #actrice #syrienne. Elle est la sœur de #Farid_El_Atrache. Merci @touti c’est plutot #historicisation le tag que j’utilise pour organiser les femmes historiques. Par rapport aux commémorations 2018 je cherchait plutot des françaises vu qu’il s’agissait d’une liste française de commémorations qui rendait hommage à la naissance de Maurras et comportait très peu de noms de femmes (12 sur 98 noms). Merci @touti. Pour rappel, on a pas mal de fans (OK : @gonzo, @nidal et @george et moi en tout cas) d’#asmahan sur Seenthis, il y a pas mal de référencement déjà. You get right, j’ai retiré le signalement à la Wikipédia. Alors dans ce cas aussi pour la liste, il faut mentionner Germaine Taillefer 7 novembre 1983 - 35e anniversaire de la mort, immense compositrice totalement ignorée et aussi Marie Jaëll décédée à Paris le 4 février 1925 - 92e anniversaire de la mort (j’ai déjà pas mal parlé des deux ici). Avec l’histoire de Maurras je découvre ces listes et je me demande aussi combien de femmes sont présentes dans ces listes. la fiche wikipédia est moins à charge : est successivement, par ses différents mariages, comtesse d’Anjou et reine des Francs. Elle était fille de Simon Ier, seigneur de Montfort, et d’Agnès d’Évreux. Barbe Acarie - Animatrice d’un cercle religieux, elle introduit en France l’ordre des Carmes déchaux. Après la mort de son mari, elle entre au Carmel sous le nom de Marie de l’Incarnation. Grande mystique, elle est la première stigmatisée française officiellement reconnue. Marquise Thérèse de Gorla, dite Mlle Du Parc - est une comédienne française née en 1633 et morte à Paris le 11 décembre 1668. Elle fit partie de la troupe de Molière de 1653 à 1667, avant de passer à l’Hôtel de Bourgogne, où elle créa le rôle-titre de la tragédie de Jean Racine Andromaque. Marie Leczinska - est une aristocrateNote 2 polonaise, fille du roi de Pologne (1704 – 1709) Stanislas Leszczynski, reine de France par son mariage avec Louis XV en 1725. De par son fils le dauphin Louis, qui épousa Marie-Josèphe de Saxe, elle est la grand-mère des trois derniers rois de France 1, Louis XVI, Louis XVIII et Charles X.
Elle est la dernière reine de France à mourir avec sa couronne. Pieuse et généreuse, elle fut une figure effacée de la cour de Versailles de par l’importance des maîtresses de son mari, en particulier la marquise de Pompadour. Charlotte Corday - est une personnalité de la Révolution française, célèbre pour avoir assassiné Jean-Paul Marat le 13 juillet 1793. Alexandra David-Néel - est une orientaliste, tibétologue, chanteuse d’opéra et féministe, journaliste et anarchiste, écrivaine et exploratrice, franc-maçonne et bouddhiste de nationalités française et belge. Louise de Bettignies - est une agente secrete française qui espionna, sous le pseudonyme d’Alice Dubois, pour le compte de l’armée britannique durant la Première Guerre mondiale. Jane Avril - fut une des danseuses les plus célèbres du Moulin Rouge où elle était surnommée « Jane la Folle » ou « La Mélinite ». 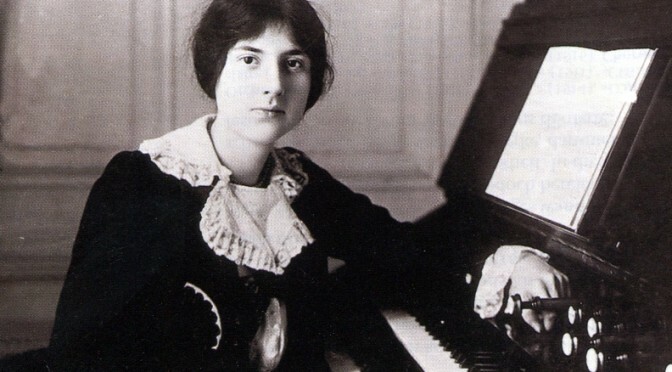 Lili Boulanger - est une compositrice française. Renée Faure - est une actrice française. Lucienne Dhotelle, dite la Môme Moineau - est une chanteuse française des années 1920. J’ai compté 12 femmes et 1 événement en lien spécifique aux femmes ( Publication des Maladies des femmes grosses et accouchées ) ce qui fait 13 entrées sur 160 et 83 hommes nommés. Attention tu as Émile Reynaud ♂ en gras. Les Shadocks ont-ils ou ont-elles un sexe ? Merci @fil j’ai corrigé. J’ai enlevé Cassandre qui est un homme aussi. Pour les Shadocks @philippe_de_jonckheere il me semble qu’ils sont désignés au masculin mais je croie pas que la question du genre soit évoqué. En tout cas ca me semble pas être un événement directement en lien avec l’histoire des femmes. J’ai mis en gras la promulgation de 1818 d’une loi interdisant la traite négrière qui me semble être la commémoration la plus importante de cette liste. Je relève au passage la célébration de Louis Althusser qui fait parti des #grand_homme pour le #féminicide d’Hélène Rytmann. 6 avril 1018, dimanche de Pâques : l’ancienne coutume de frapper un Juif dans l’église pendant la semaine sainte se termine tragiquement à Toulouse. Le Juif a le crâne brisé, qui laisse échapper sa cervelle (selon Adémar de Chabannes)14. L’épidémie dansante de 1518 est un cas de manie dansante observé à Strasbourg en Alsace (qui faisait alors partie du Saint-Empire romain germanique) en juillet 1518. De nombreuses personnes dansèrent sans se reposer durant plus d’un mois, certaines d’entre elles décédèrent de crise cardiaque, d’accident vasculaire cérébral ou d’épuisement. T’es pas obligé de commémoré toutes ces momies ni tous ces éventements. C’est assez logique qu’à une échelle de 65 millions de personnes on trouvent le moyen d’avoir une fête d’anniversaire chaque jour de l’année et des commémorations de tout et n’importe quoi tout le temps. Je pensait que la liste serait plus longue d’ailleurs et je pense qu’il faudrait y ajouter minimum une bonne soixantaine de noms de femmes. Paulette LECONTE, née en 1918, résistante. Les polémiques autour des enjeux sociaux et politiques des cycles de plus en plus intenses de commémorations et des hommages nationaux et étatiques à telle ou telle personne se multiplient au fil des années au rythme d’une démultiplication de ces modalités particulières de faire récit et de faire vivre des mémoires. Nous étions un certain nombre à nous réjouir, au CVUH comme ailleurs, de la suppression du nom de Charles Maurras de la liste des commémorations nationales pour l’année 2018, à la suite du débat et de l’émotion légitimes provoqués par la prise de conscience de la présence du fondateur de l’Action française dans cette liste. Nous avons été étonnés de lire dans le numéro du Monde daté de mardi 30 janvier une justification de la présence sur cette liste de Charles Maurras, nationaliste fanatique et anti-républicain militant, de la part de deux des historiens membres du Haut Comité aux Commémorations nationales, Jean-Noël Jeanneney et Pascal Ory, et encore plus étonnés de découvrir l’argumentation visant à la légitimer. En réaction aux propos tenus dans le « M Le magazine du Monde » par Daniel #Cohn_Bendit et Romain #Goupil, les deux anciens de la Ligue communiste révolutionnaire défendent le message et les valeurs de Mai 68 dans une tribune au « Monde ». Symboliquement, avant tout. Cette #sculpture a été proposée par l’artiste comme un « #symbole de #souvenir, d’optimisme et de rétablissement, afin de surmonter les terribles événements qui ont eu lieu à Paris », hommage aux victimes des attentats du 13 novembre 2015. Or le choix de l’œuvre, et surtout de son emplacement, sans aucun rapport avec les tragiques événements invoqués et leur localisation, apparaissent pour le moins surprenants, sinon opportunistes, voire cyniques. Démocratiquement en outre, si une œuvre d’une importance inédite devait être placée dans ce lieu culturellement et historiquement particulièrement prestigieux, ne faudrait-il pas procéder par appel à projets, comme c’est l’usage, en ouvrant cette opportunité aux acteurs de la scène française ? D’une formidable vitalité, la création de notre pays bénéficierait grandement d’une telle proposition. 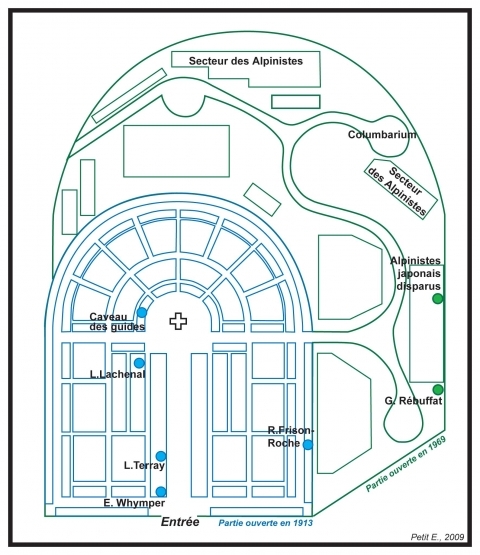 Architecturalement et patrimonialement, par son impact visuel, son gigantisme (12 mètres de hauteur, 8 de large et 10 de profondeur) et sa situation, cette sculpture bouleverserait l’harmonie actuelle entre les colonnades du Musée d’art moderne de la ville de Paris et le Palais de Tokyo, et la perspective sur la tour Eiffel. 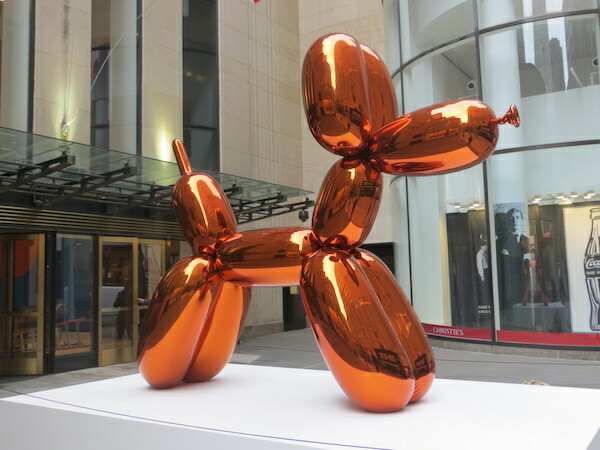 Artistiquement, créateur brillant et inventif dans les années 1980, #Jeff_Koons est depuis devenu l’emblème d’un #art_industriel, spectaculaire et spéculatif. Son atelier et ses marchands sont aujourd’hui des multinationales de l’hyperluxe, parmi d’autres. Leur offrir une si forte visibilité et reconnaissance ressortirait de la publicité ou du placement de produit, et serait particulièrement déplacé dans ce lieu très touristique, entre deux institutions culturelles majeures, dévolues notamment aux artistes émergents et à la scène artistique française. Financièrement enfin, cette installation serait coûteuse pour l’État, et donc pour l’ensemble des contribuables. Car l’artiste ne fait don que de son « idée », la construction et l’installation de la sculpture, estimées à 3,5 millions d’euros au minimum, étant financées par des mécènes, notamment français, qui bénéficieraient d’abattements fiscaux à hauteur de 66% de leur contribution. De plus, les travaux préalables, pour renforcer le sous-sol du #Palais_de_Tokyo, immobiliseraient longuement certains de ses espaces et entraîneraient pour le centre d’art un important manque à gagner. Techniquement en effet, placer 35 tonnes au-dessus des salles d’exposition du Palais de Tokyo est un défi important. Déjà incertaine, la sécurité d’une telle entreprise à long terme est impossible à garantir. Nous apprécions les cadeaux, mais gratuits, sans conditions et sans arrière-pensées. 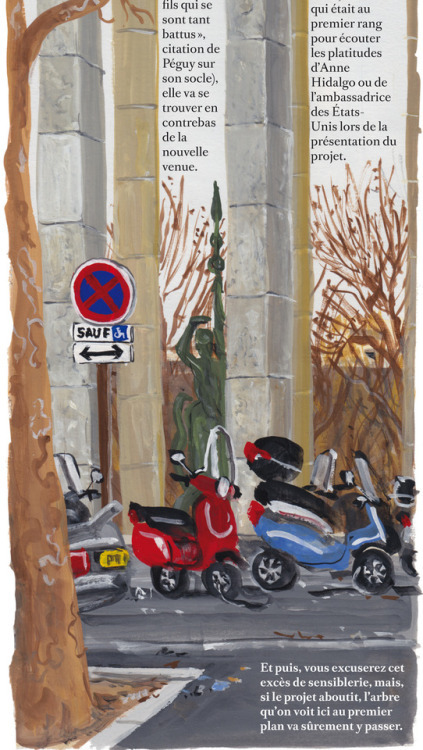 Histoire de sculpture – gouache, décembre 2016 (in CQFD janvier 2017). Phénomène de défiance vis-à-vis de l’artiste-businessman ? Hermétisme à l’art contemporain ? 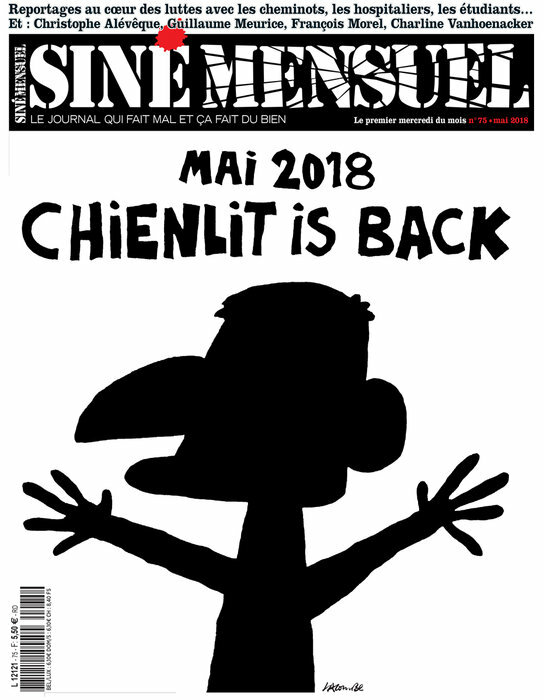 Rien n’est moins sûr. 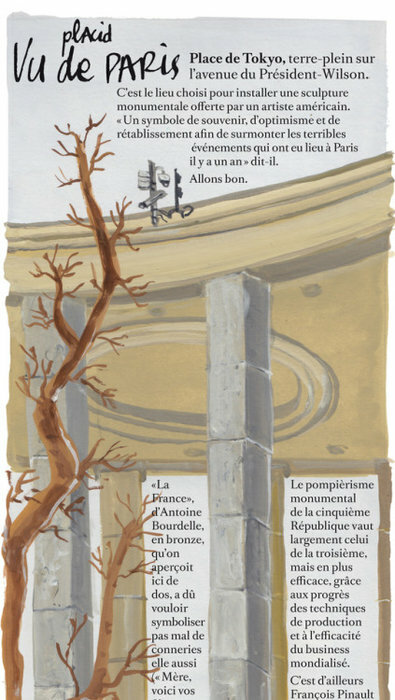 Lundi dernier, dans une Tribune publiée dans Libération, ce sont bien des acteurs avertis et qualifiés de la Culture et de la scène contemporaine qui s’opposent à l’installation de la sculpture. 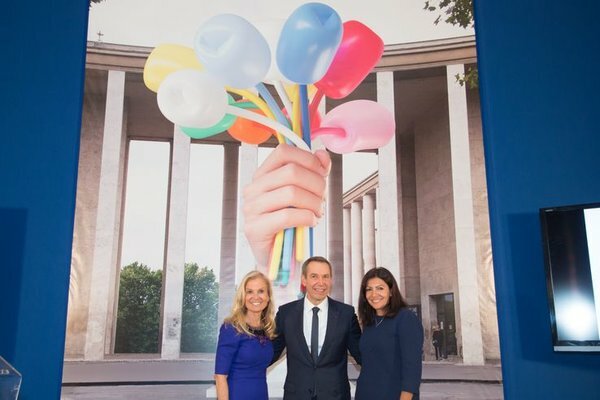 Selon eux, le « projet est choquant », et ce, pour des raisons artistiques et patrimoniales, mais aussi financières (puisque #Jeff_Koons n’offre que l’idée de l’œuvre et la sculpture réalisée elle-même) et … symboliques. 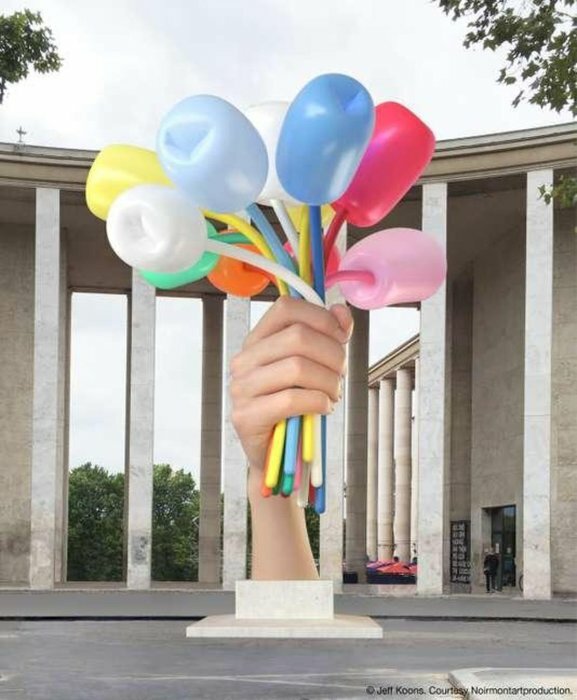 Si un #cadeau ne se refuse pas, le bouquet de tulipes de Jeff Koons, offert en signe de fraternité, sème la discorde, soulignant ainsi la complexité de la #politique_culturelle, et l’importance de la portée symbolique des œuvres d’art destinées à l’espace public. Pour en parler, nous recevons Yves Michaud, philosophe et critique d’art, auteur de Citoyenneté et loyauté (Kero, 2017) et de L’Art à l’état gazeux : essai sur le triomphe de l’esthétique, (Stock, 2003), et Stéphane Corréard, critique d’art, directeur du salon Galeristes, signataire de la Tribune “Non au « cadeau » de Jeff Koons” dans Libération ; il contribue aussi régulièrement à l’émission La Dispute sur France Culture. Le nom tulipe provient du turc tülbend (lâle), c’est-à-dire « plante-turban ». Une tulipe est présente dans le drapeau de l’Iran. De couleur panachée ou mélangée, elle peut traduire deux significations. D’un côté, elle suscite l’admiration et d’un autre, elle exprime une séduction des plus folles. 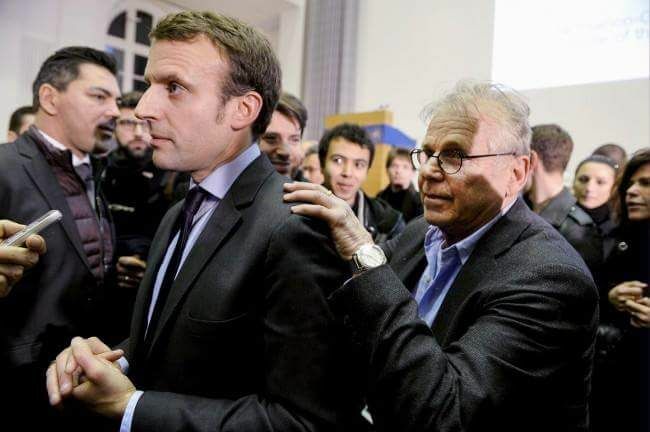 La personne qui l’offre veut aimer sans retenue et à la folie. Il n’existe pas au Royaume-Uni de registre officiel ou de commémoration des femmes tuées par des hommes. C’est pour cette raison que la militante féministe KAREN INGALA SMITH commémore leur nom et leur image sur les réseaux sociaux. En juillet 1981, lors de la première Conférence féministe pour les femmes latino-américaines et caribéennes en Colombie, la date du 25 novembre a été déclarée journée annuelle de protestation à la mémoire de trois sœurs militantes, Patria, Maria Teresa et Minerva Mirabel, qui ont été assassinées en raison de leurs efforts pour renverser le gouvernement fasciste de Rafael Trujillo. Dix-huit ans plus tard, les Nations Unies ont désigné le 25 novembre Journée internationale pour l’élimination de la violence à l’égard des femmes. 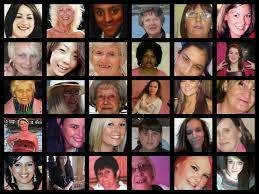 Cette année, comme je le fais depuis quelques années, je vais commémorer les femmes britanniques tuées depuis un an par des hommes (ou lorsqu’un homme est le principal suspect dans l’assassinat d’une femme, puisque de nombreuses affaires n’ont pas encore été jugées). À partir de 8 h, sur le compte Twitter @countdeadwomen, j’inscrirai le nom et l’âge de chacune de ces femmes et, si j’ai pu la trouver, une photo d’elle. Jusqu’à présent, j’ai prévu inscrire les noms de 127 femmes et filles. La mention de chaque nom toutes les 10 minutes exigera plus de 10 heures. J’ai amorcé ce projet, que j’en suis venue à appeler Counting Dead Women, en janvier 2012 après le meurtre de Kirsty Treloar, 20 ans. Le “#Colombus_Day”, célébré chaque année pour commémorer la découverte de l’Amérique par le navigateur gênois, fait polémique outre-Atlantique. Il est de plus en plus remplacé par des hommages aux “peuples indigènes”, déplore ce quotidien conservateur madrilène. Peut-on encore honorer Christophe Colomb ? Comme d’autres villes américaines, New York, où se déroulait lundi le traditionnel défilé en hommage du « découvreur de l’Amérique », se pose la question, dernière illustration du débat ultra-sensible sur l’histoire et le racisme aux Etats-Unis. Le monument aux victimes du massacre d’ Utøya (Norvège) ne sera pas réalisé. 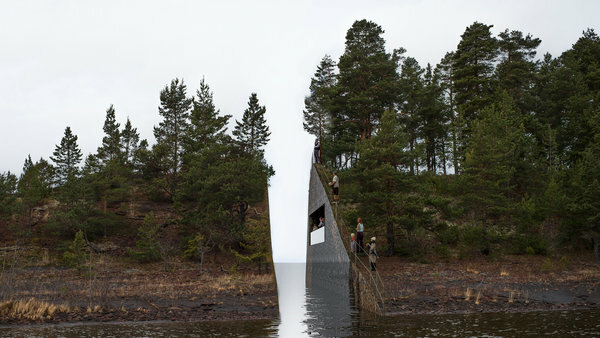 The Memory Wound memorial, by Swedish artist Jonas Dahlberg, was intended to commemorate the 77 people who died in the 22 July 2011 attacks, which centred on a Workers’ Youth League summer camp on Utøya. 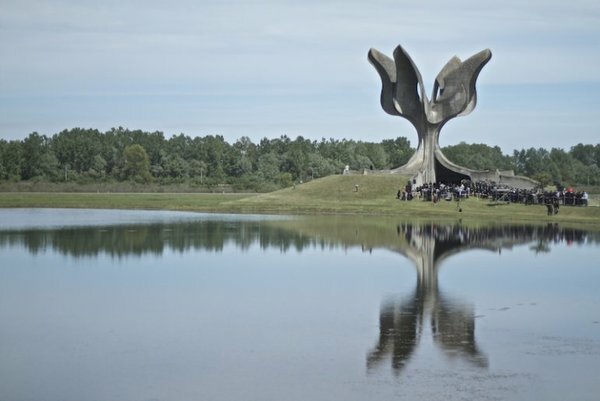 The memorial would have involved cutting a slit into the Sørbråten peninsula just across from the island, but the Norwegian government has announced it is scrapping the plans in response to a lawsuit from residents. 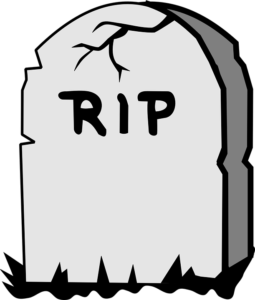 The new memorial destined for Utøykaia is yet to be chosen. Personnellement je trouvais ce projet très beau, puissant... sans doute trop. @vazy, oui, c’est dommage, très beau geste de sculpteur et sans doute as-tu raison de penser que c’était trop puissant et que c’est pour cette raison que le projet est annulé. ... Où il semble que deux artistes en compétition ont eu la même idée au même moment. @philippe_de_jonckheere tu me fais rire. Merci. Ce projet à sans doute été beaucoup desservis par les visuels réalistes tape-à-l’oeil-du-jury. Ce rendu obligé Autocad/Photoshop comme pour n’importe quel concours d’archi, est totalement inapproprié au sujet. De même l’idée de crypte, très belle, est dénaturée par l’ouverture façon baie vitrée, d’un lieu de recueillement on passe à un « point de vue » . Je comprends que certain habitants aient pu dénoncer une attraction touristique indécente. Merci @reka pour le lien. Stéphane Audoin-Rouzeau, historien de la Grande Guerre, a été ébranlé par ses séjours au #rwanda. Il livre un texte à la fois personnel, scientifique et cinglant sur l’implication de la #France dans le génocide des Tutsis, qui résonne d’un poids particulier sous la plume de ce « conservateur », spécialiste de l’anthropologie du combat et des massacres de masse.